A slow growing, rounded, bushy, small tree with large green, deeply dissected, serrated leaves. 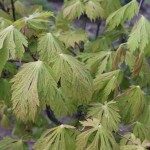 In spring, reddish-purple flowers appear before the leaves. The fall color is an outstanding crimson. The bark is smooth and gray. Prefers light shade, in a rich, well-drained soil, but will tolerate many soils with regular summer watering.